If you’ve ever fantasized about giving up the day job, you’re in the majority: A whopping 80% of people over age 45 have considered changing careers.1 And 1 in 4 new businesses are started by those over 55.2 So, what’s happening to motivate so many to make a change? It may be the financial stability that can often come with peak earning years. For some, it’s simply the desire to pursue another calling. Others may be testing the waters for a new “encore career” in the future. Whether you’d like to do some consulting on the side or become a full-time business owner or employer, striking out on your own doesn’t have to be a major financial risk — with the right planning. Many of today’s entrepreneurs are reducing startup costs by relying on technology and networking. It’s also becoming more common to get a side businesses going during off-hours, keeping the day job for a while before fully committing to going solo. Here are three key financial considerations to explore with an advisor before taking the first steps. Planning on leveraging your professional skills to start a consulting business? Startup costs may be lower for businesses focused on services rather than a physical product — though you may still have expenses such as legal, marketing and subcontracting fees. For example, a website design company could require additional technology resources or a graphic designer. Before tapping into your own assets or taking out a small business loan, you may want to look into alternative funding options such as angel investors or crowdfunding, both of which involve less personal risk in exchange for equity or partial ownership in a business. Depending on the type of business, economic development loans can be another way to raise funding through your city or state chamber of commerce. About 67% of small-business owners fund their first entrepreneurial venture with their savings.3 If you do choose this route, it’s vital to protect other personal assets — such as your home — by choosing the right business legal structure for your business. The Small Business Administration offers more details and resources at sba.gov. Setting up the right business structure is also crucial to managing your tax bracket. For example, with a C corporation, which is an organization taxed separately from its owners, you’ll pay taxes on taxable income (gross income less deductible expenses) at rates starting at 15%. S corporations enjoy some of the benefits of incorporation but are taxed as a pass through entity, so they allow for income losses, deductions and credits to be included on personal returns. An LLC (limited liability company) is a bit of both, combining the characteristics of a corporation and a partnership — and members of the company cannot be held personally responsible for the company’s debts or liabilities, but pay taxes like a partnership for federal income tax purposes. It’s important to weigh the options in terms of your unique business scenario and personal financial situation. Solo retirement plans can also be a powerful tool for keeping your tax burden manageable by reducing taxable income. The most popular retirement savings plans for entrepreneurs include the individual 401(k) and the Simplified Employee Pension (SEP IRA). If you’re considering setting up a new retirement plan, you may also want to talk to your advisor about the pros and cons of consolidating 401(k) plans from previous employers. It’s a good idea to revisit your overall risk tolerance and asset allocation and align them with new goals, which may include delaying retirement to start a business. While collecting Social Security earlier to use as a safety net while starting a business sounds like an appealing idea, it could hamper your growth. If you haven’t reached the designated full retirement age (FRA) for the year you were born and you earn more than the 2017 limit of $16,920, you’ll have $1 in Social Security benefits withheld for every $2 in earned income over the limit. For the year in which you reach your FRA, the current limit jumps to $44,880, with $1 withheld for every $3 earned in excess of the limit. In the years after reaching FRA, Social Security payments are no longer withheld for those working and receiving benefits at the same time. Your benefit amount will also be recalculated to give you credit for any months in which you did not receive a payment because of your earnings. The SSA sends out a notification letter with details about any increase in benefit amount. Remember that Social Security benefits are also subject to tax if your income reaches certain levels. Extra income could allow you to postpone Social Security withdrawals, which means higher benefits in the future. For example, if your FRA is 66, delaying collecting would increase overall lifetime benefits by 8% each year until you reach the maximum amount at age 70. Self-employment can be a great way to “bridge” the years between leaving a regular paycheck and collecting Social Security benefits. 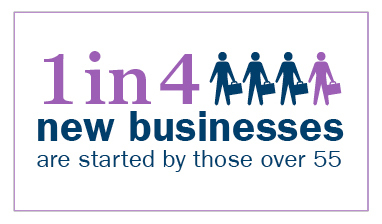 Thinking of consulting or starting a business but not sure where to begin? One of the first things any would-be entrepreneur should do is consider meeting with a financial advisor, who can help you consolidate assets, explore tax-friendly investing options and make any adjustments to your overall plan. Your advisor can help you plan for your next brilliant moment. An Ameriprise financial advisor can help you plan for your next brilliant moment.